Powers/Abilities: The alien had a humanoid body, pale yellow skin and large fish-like eyes, but he displayed no paranormal abilities. 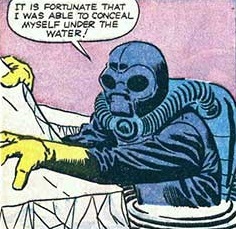 Wearing an environmental suit which allowed him to submerse himself in frigid water, the alien traveled to Earth in a spaceship. 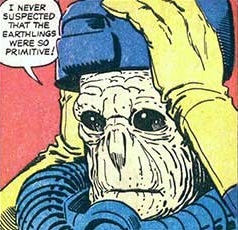 Although his reasons for coming to Earth were unrevealed, the alien seemed to have benevolent intentions. (Journey into Mystery I#84/3 (fb) - BTS) - For unspecified reasons, the alien traveled to Earth and landed his spaceship in the waters of the Arctic region, near the cabin of Jacque. The alien made first contact with Jacque and apparently told him that he could teach mankind how to live in peace and abolish crime and sickness; Jacque excitedly ran off to tell others about the unearthly visitor. 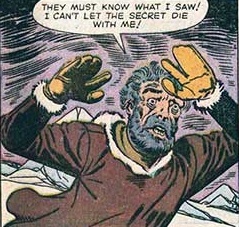 (Journey into Mystery I#84/3) - Stumbling through the frozen wasteland, weak with fatigue and numb with cold, Jacque made his way to the cabin outpost of his two "neighbors". Seeing the weakened condition the old man was in, the men carried the exhausted Jacque into their cabin and had him lay down on a cot; but the trek through the Arctic wilderness had taken its toll on Jacque, for he was near death. Jacque weakly told his "neighbors" about the alien and how the extraterrestrial visitor could help mankind, then he implored the men to find the alien by the giant iceberg near his cabin. With the physical strain having been too much for him, Jacque apparently died. The two men drove their dog-sled to Jacque's outpost and saw the giant iceberg that he had mentioned. Seeing no sign of life anywhere, the two climbed to the top of the iceberg to have a look around; but although they could see for miles in every direction, they saw nothing but snow and ice. 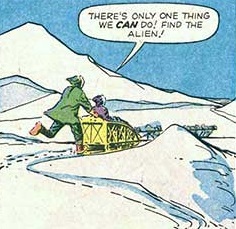 Finding no trace of an alien, the two men concluded that Jacque must have been delirious and had only been hallucinating, so they climbed back on their dog-sled and returned to their cabin. 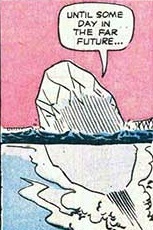 As the men left, the alien emerged from concealment in the icy waters. 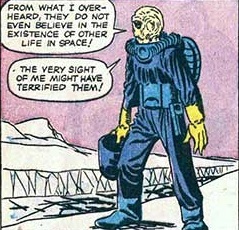 Removing his environmental suit's helmet, the alien thought aloud--he hadn't suspected that Earthlings were so primitive, but from overhearing the two men's conversation, he figured Earthmen didn't believe in the existence of other life in space, and he suspected the very sight of him would have terrified the two men. The alien decided it would be best to return to his spaceship (actually the "iceberg") and leave the planet; as his spacecraft took flight, the alien thought he would just avoid contact with Earthlings until the human race had matured. Comments: Created by Stan Lee (writer) and Steve Ditko (artist). This 5-page story -- Somewhere Hides a... Thing! -- was in the same issue as the second Thor story, so it's possible that it took place in the early days of the modern Marvel Universe. 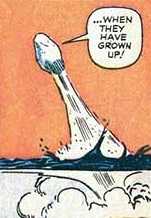 In regards to the alien's height and weight: The three panels you see in this profile are pretty much his entire appearance in the story, and although Jacque had described the extraterrestrial as "huge," there's nothing in the panels to gauge his size against, so it's difficult to estimate how large the alien really was. (For some reason, he visually reminds me of the alien Marrina Smallwood @ Alpha Flight I#1). In regards to Jacque's "neighbors": Their names were never mentioned, but considering the story's title and setting, I suggest calling them "Kurt" and "Russell" (see HERE for an explanation why). The elderly Jacque was a trapper who lived alone in an isolated cabin in the Arctic region. An alien had landed his spaceship near Jacque's cabin; the extraterrestrial visitor apparently told Jacque that he could help to solve the ills of mankind. Jacque excitedly ran off to tell others, but his trek through the rugged terrain had been too much for the elderly man, and by the time he reached the cabin of his two "neighbors," Jacque was near death. The two men took Jacque into their cabin to recover, but he was too far gone. After Jacque told the men about the alien and where they could find him, he apparently died. 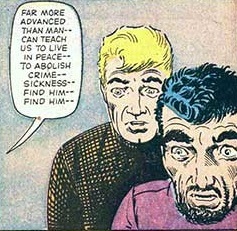 Two unidentified men (see comments), they were stationed in the Arctic region and lived in a cabin outpost near Jacque's cabin. One day, Jacque came running to them in near hysteria, claiming to have encountered an alien visitor; after telling the two where they could find the alien, Jacque apparently died. The two men decided to investigate the old man's claim and drove their dog-sled to Jacque's cabin. 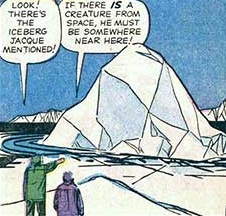 They climbed a large "iceberg" to check out the area, but although they could see for miles, they found no sign of life. Reaching the conclusion that Jacque had been delusional, the men climbed back aboard their dog-sled and returned to their cabin, never realizing that the "iceberg" was actually an alien spacecraft. The spacecraft of the alien, it transported him to Earth, where it floated in the waters of the Arctic region near Jacque's cabin. When Jacque's "neighbors" first saw it, they assumed the spaceship to only be an iceberg. 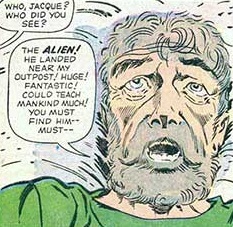 After Jacque's "neighbors" left, the alien climbed aboard his spaceship and departed. Special Thanks to http://www.g-mart.com/ for hosting the Appendix, Master List, etc. !